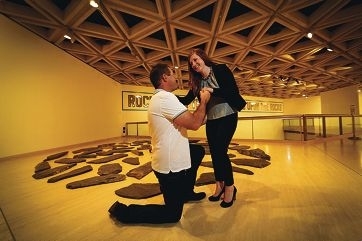 Callum Henderson proposed to Samantha Libby at the Art Gallery of WA last month. Mr Henderson (34) spent two months sneakily putting the event together ” choosing the WA Art Gallery as the memorable location and organising staff to have a photo of the lovebirds blown up and hung as part of the Van Gogh, Dali and Beyond: The World Reimagined exhibition. He popped the question on July 26 as part of the South Guildford couple’s third anniversary celebrations. Mr Henderson took Miss Libby (22) to Perth for a night out but she had no idea what was about to happen. ‘He brought me to the winter markets in the city, then we trekked across to the art gallery and all I did was complain about my sore feet because of the heels I was wearing,’ she said. ‘Inside the gallery, there was a band playing jazz and we made our way upstairs for a guided tour. But that wasn’t the only surprise Mr Henderson had up his sleeve.